To celebrate the career of Dan Wheldon, legendary IndyCar broadcaster Mike King has given AUTOSPORT access to his latest show, which features two interviews with the late series champion. 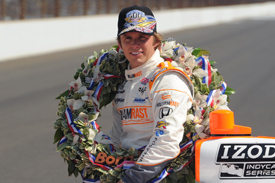 One follows on from Wheldon's first Indy 500 win in 2005. The second was recorded at the beginning of 2011 as he reflects on the glory days at Andretti Green Racing, his love of IndyCar and his opinion on a number of other matters, including a salute to the men and women of the military, whom he'd represented while driving in the Nation Guard-sponsored Panther entry. Click play below to listen now.